One of the most interesting Baltic films scheduled for release in the new year is Butterfly City, a feature documentary about the small, remote and mostly Russian-speaking city of Visaginas in Lithuania, constructed during the Soviet period to serve the Ignalina nuclear power plant and how its residents are coping with economic turmoil resulting from the decommissioning of the plant and feelings of marginalisation in Lithuania (which, unlike the other two Baltic states, has only a small Russian minority). Below, the film’s director, Dublin-based Olga Černovaitė tells Deep Baltic about her motivation for making Butterfly City and her own experiences as a Russian-speaking Lithuanian. In the early 1970s my parents moved from Russia to Vilnius, the capital of the Lithuanian SSR, in search for work and better life. This is where I was born. In Lithuania, relations with the Russian minority have become normalised… on the surface anyway, and despite the bad history. I feel completely Lithuanian and feel integrated into society. But I know that’s not the case for everyone. I know there are communities that live “apart” and I wonder how they live their lives. People here notice my Russian name. I sometimes wonder do they truly accept me, who was born and lived my whole life in “their” country, who speaks “their” language perfectly? 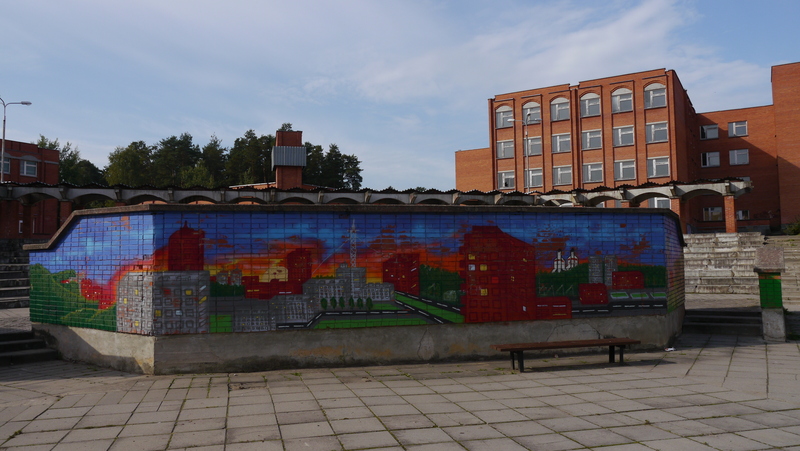 Four years ago, I visited a city that is very different from the rest of Lithuania – Visaginas – where one barely hears the Lithuanian language, the predominant language being Russian. Most people living there are either Russian, or of Russian background, or from another former Soviet republic, but there are few “real” Lithuanians. Even people born there don’t consider themselves really Lithuanian. How strange, I thought. The city only exists since the 1970s and was designed, out of nothing, in a spirit of idealism, and attracted people from all over the USSR, but now the nuclear power plant it was built to service is being shut down. The open-heartedness of people, the atmosphere in the city, the inner ambience reminded me of my childhood days, and so I was looking forward to returning to this city. Still today, though, there was something about this city that made me think of a kind of “mini-USSR” – if it is permissible to remember not just the bad things of the “old regime…” In a strange way I felt at home in Visaginas, if home could be expressed in time instead of as a place. I felt that I understood the spirit of this city and I could empathise with the situation of the people there, who were losing their jobs and facing an uncertain future. In a strange way, being there was like going back in time and then witnessing the disappearance of this earlier, more innocent time. But I also felt curious about these Lithuanian “Russians” – because in a way they were like me, and yet not quite… Like me, they have Russian blood, language, family, culture, religion, etc., but unlike me, for them “real Lithuania” seems like a different country, with foreign people speaking a strange language. Of course I wonder how they manage in their heads questions about who they are – questions that I and maybe everyone asks themselves, and how do they reconcile where they live with who they are? So who are we, those born here – still Russians? This question I hear very often. And I ask myself – who am I? I do not live on my forefathers’ land, I do not really keep Russian traditions and customs, but I still speak my mother tongue. Now I live in Ireland and have a little daughter – which language should I teach her first? This Russia my mother is from – Astrakhan – I have only visited once in my life, but according to popular stereotype, I am supposed to be carrying it in my veins and in my genes, and feel some deep sense of attachment. So I would like to explore these questions, through the medium of portraits and stories of people living in this city. There are no easy answers, but even asking the questions helps a little to understand more about myself, but also more about this country I live in. Butterfly City is scheduled for release in the new year.